The 2nd FestiFools Parade is coming around faster than you can get dishpan hands from working with papier-mâché (which, trust me, is pretty fast). On Sunday, April 6 from 4–5pm, giant, fanciful puppets (and foolish co-conspirators) will once again descend upon downtown Ann Arbor, and dance like there’s no tomorrow. If you were at last year’s parade, get ready for even more awesomeness. If this will be your first FestiFools… well, there’s no way to prepare for the excitement that awaits you! 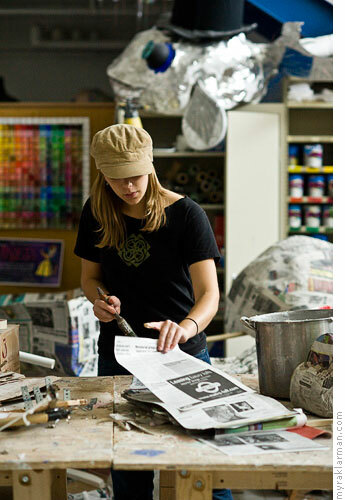 Puppet making: Julie Foster works with papier-mâché. Co-Directors Mark Tucker and Shoshana Hurand, U-M students, and community volunteers have been hard at work on the puppets since January, and I have been lurking in the studio with my camera. Get a behind-the-scenes look into the early stages of the puppet-making process through photographs I’ll be exhibiting at Sweetwaters Café (Washington St.) starting Wednesday, March 19. My thanks to Lisa Bee of Sweetwaters for both hosting and sponsoring the exhibit. 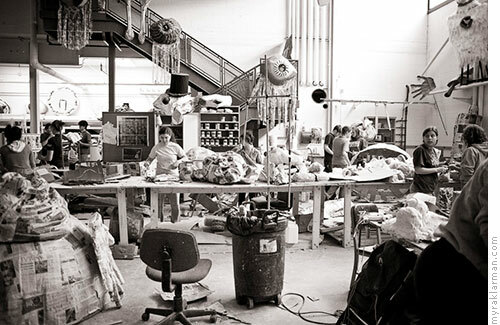 U-M students and community volunteers work side-by-side in the FestiFools studio. Puppets from last year’s parade oversee the progress from the rafters. Sweetwaters will also host an exhibit of photographs taken during the parade. This year, I’m inviting anyone who photographs the parade to submit a few of their favorite images for a juried group photography show. Here’s your chance to have your artwork hang at Sweetwaters from mid April until June, and let Ann Arbor see the parade from your unique perspective. Just look at the wide variety of shots taken last year. Truly, it takes a village of photographers to do this event justice. If you’re interested in participating, you can learn more through the Ann Arbor flickr group or by dropping me an email (myra [at] myraklarman [dot] com). You might think I’m gah-gah over FestiFools, and I am. But my enthusiasm pales in comparison to my husband, Rich’s. 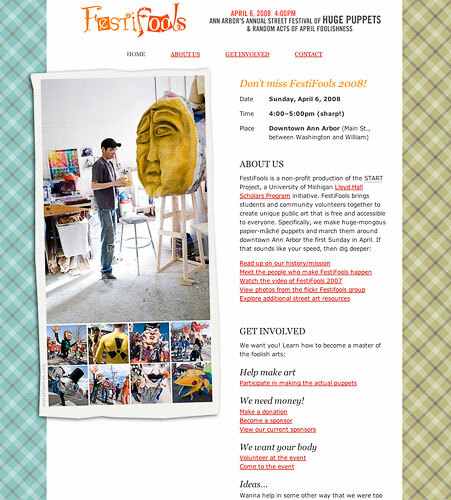 He joined the FestiFools board, and volunteered to redesign and execute the new FestiFools website. It’s foolishly terrific. Rich came out of web design retirement to win one more for the Gipper. FestiFools logo by U-M student Nate Chmielewski.